Ongoing operational support for public, educational and governmental access media services from franchised cable operator, Suddenlink Communications. Access to studio for video production or internal training. Classes available to train and educate members on proper use of equipment and facilities. After completion and certification, members can rent equipment, schedule studio time and use the editing stations to create their program. A high-definition recording studio is available. The camera packages available to members consist of Canon HV20 & HV40 HiDef cameras, a variety of microphones (stick, lavaliere & shotgun), and tripods. A three-lamp Colortrans light kit is also available to members who have completed the course. Alchemy is a small craft distillery in Arcata, CA. Their focus is on small batch, high-quality spirits made exclusively on American made equipment. They source their grain as locally as possible with 100% of their wheat and rye coming from Humboldt County and all of their corn is California grown less than 300 miles away. A full service forest products business providing lumber, flooring, milling, wood sales, reused lumber, kiln drying, and more. ERA provides both commercial and retail sales and is on the same site as Almquist Lumber. ERA sells FSC certified wood. ERA will broker used lumber. Continuous availability of native hardwoods and softwoods keeping a regular presence and availability in the market. Member of the Healthy Forests, Healthy Communities Partnership. They have been inspected by a representative of the regional program of Sustainable Northwest, and have met the criteria for certification. The complete log is utilized: from lumber and product, to the product produced from scraps, to the mulch from the sawdust. Local woods: for lumber products, flooring, etc. It is unique these days to provide this range of services. 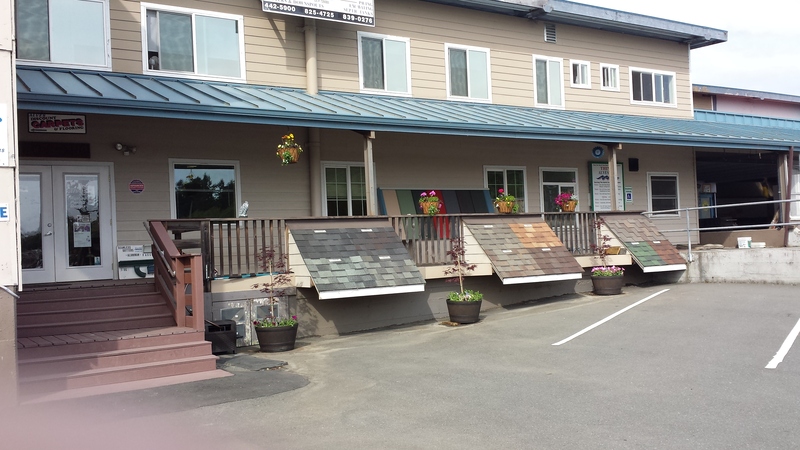 Work 4200 West End Road Arcata CA 95521 work Work Phone: 707-825-4725work Website: Alves Inc.
Alves is an integrated business that includes roofing installation on buildings (composite, metal, tar roof) both commercial and residential and paving of roads and parking lots. After re-roofing, Alves sorts the old roofing materials and recycles the materials into usable products: road base (with cement, brick, and asphalt), metals, and fire wood. Alves has a Construction and Demolition permit. They have a paving service that uses their road base product for paving private roads and parking lots. Highlights: road base (recycled content); roofing (residential and commercial); asphalt paving service; scrap wood/firewood; construction & demolition drop-off (by arrangement). Road base: for use on private roads, driveways, parking lots, and trails. Alves road base displaces quarried gravel lowering the impact on local rivers. Composite shingles are ground up into RAS (recycled asphalt shingles), mixed with construction and demolition materials – discarded cement, brick, and asphalt, – and then used as a road base under their asphalt paving. It compacts very well and meets compaction requirements. Starting at the job site, tear –off roofing is dropped into roll-off trucks and routed to Alves facility. Other C&D (Construction and Demotion) materials are dropped off. All materials are weighed and source separated into the prospective bins: metal, steel, wood, non-recyclables, and the materials that go into the recycled content road base. The remaining asphalt shingles are ground up into RAS (recycled asphalt shingles) and mixed in with ground materials that have been generated from their demolition jobs, other C&D sites, and concrete, asphalt, brick products from the public drop off. Metals are recycled through local metal recycling businesses. Wood is available as fire wood free to the public. American Hydroponics provides state-of-the-art crop performance products and services for people to grow crops successfully, year ‘round for pleasure and profit in any environment with an emphasis on conserving resources. American Hydroponics known for its innovation by leading the industry with easy-to-access, high-performance horticultural products, greenhouse supplies, resource conservative equipment as well as unique products and knowledge that no one else in the industry has. They have been designing and building energy and water efficient hydroponic systems, blending plant foods and biostimulants for over 30 years and know how to use them to grow thriving crops. Hydroponic horticultures uses one tenth of the water traditional agriculture uses. With lettuce, traditional agriculture grows 5 crops a year, hydroponics can grow 26. No comparison when it comes to efficient use of space and resources. Hydroponic horticulture when coupled with greenhouses CEA (controlled environment agriculture) produces food all year round can be easily localized in ANY environment from Alaska to Tampa FL. American Hydroponics has 30 years of experience with recirculating hydroponics and providing growers support internationally. All products are manufactured in America. Benefits for people in urban areas: allows people to grow large volumes of produce locally in urban areas without the use of soil, shorter farm to table distances mean higher quality produce, fresher, more nutritional. Minimal distribution costs. Systems are being used on rooftops in NY to grow food locally. Visit their “Get Started” page and select which the range of options from Hobbyist to Experienced growers. Business Inquiry: How does someone contact business if interested? Thermoformer is a heat and plastic forming machine that allows the manufacture of specially designed tray & reservoir designs. American Hydroponics uses a unique ABS plastic made from 75% recycled material. 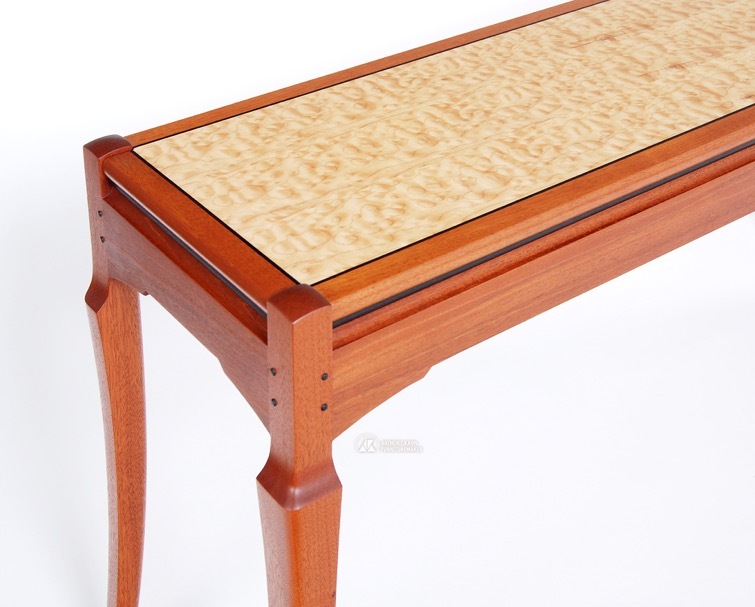 Anthony Kahn designs and builds contemporary handcrafted furniture. With fine craftsmanship and artisan quality, the furniture offers exceptional beauty and utility, each piece an original – signed and dated. Careful selection of highly figured woods, and the expert application of smooth, lustrous finishes are the hallmarks of Kahn’s work. Furniture is built using fine exotic and domestic hardwoods: Oregon Walnut, Cherry, Curly Maple, Pacific Quilted Maple, and Eastern Maple. Furniture finishes are hand applied varnishes and oils that are dried in between applications creating a very smooth protected surface. Anthony finds wood and transforms it into special and unusual furniture incorporating developed design elements. Anthony creates his own veneers from taking solid slices from beautiful dimensional lumber. Anthony has years of experience in product development and knows how long a project will take. He runs a very efficient wood shop. He maintains scrupulous attention to detail where a special piece of lumber is transformed in to something beautiful and exceptional. Works with larger projects such as Boutique hotels, etc. He has a unique ability to interpret and achieve the clients’ vision when working on commissioned pieces. Veneers: Anthony finds beautiful wood and enhances and transforms the special aspects of each piece of wood. 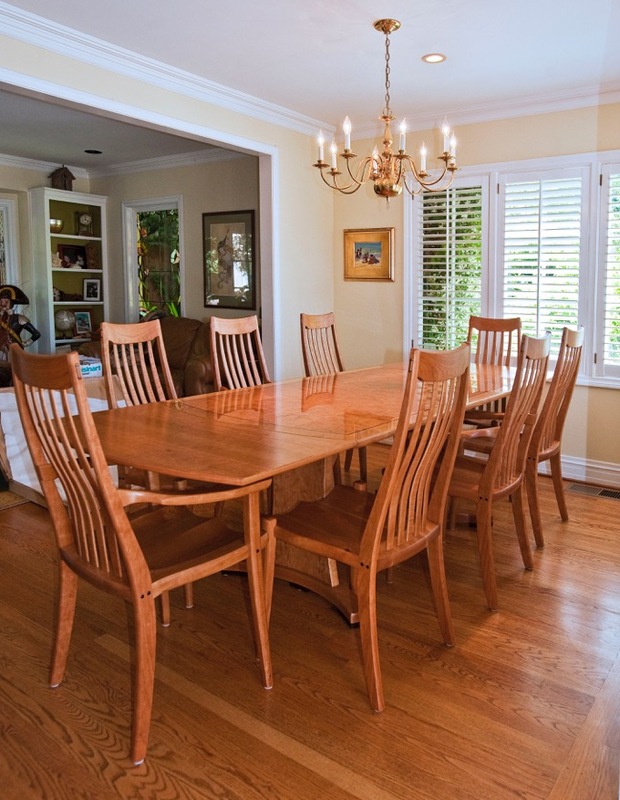 Arcata Millworks specializes in high-end doors, grand entryways, furniture, and architectural millworks. All doors have engineered cores for the stiles to insure a warp free future. Besides the cope and stick gluing surface they also use ½ inch dowels in the rail to stile connection. Their furniture is built using classic joinery such as mortise and tenon, dovetails, and other non-mechanical means of holding one piece of wood to another. A full-service bakery where they purchase locally grown grains directly from the farmer, work with the farmer to grow what they can use, and stone mill the grains on their own granite grist mill. Bread, rolls, desserts, crackers, and more using their stone ground flour. Carmel corn, Carmel sauces, and Cookies made with a range of beer. 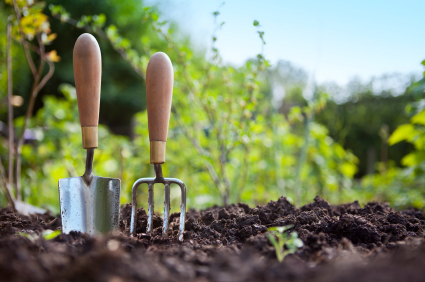 Beneficial Living Center and Garden Supply Store combines their locally manufactured fertilizer supplies that naturally enrich the soil, with workshops, storefront and web store, and soil analyses and counseling. Product enriches the present soil. Blue Ox Millworks creates authentic custom millwork for private homes, historic cathedrals, national parks, and commercial buildings throughout the United States. Their millwork focus is Victorian but they also specialize in meeting the millwork demands of new and original architectural designs. They include reproductions, renovation, restoration, structural or decorative. Victorian gingerbread or Victorian reproductions. Blue Ox has their own mill so they can mill up all lumber to requested dimension. CNC programming, edit and prove out new programs and setups. Manufacturing short to medium quantity (10 – 500) repeat order runs of small parts from prints (specialty). Prototype and help with design modifications to reduce production cost. 11 years in the business. Product and parts in aluminum, plastics, stainless, titanium, and various other materials. Bobby Hill has provided complex part and product design assistance and production from start-ups to experienced businesses. Repeat runs: Ideal projects consists of manufacturing 10 – 500 parts, with repeat order every 2 – 6 months. Has worked on a wide range of projects from woodworking to agricultural to parts for nuclear reactors (complex, with critical level of detail necessary). Owner has a very wide background of experience and a broad understanding and skills for machines and parts. CNC Machining: (3) CNC machining centers approximate travel 16” by 30” can hold larger work machining parts in stages. Sheet metal cutting up to 12 ft. Manufacturer, storefront, and website store: “Body care products including soaps, lotions, oils and hair care products created with the finest natural ingredients and essential oils”. See website for specific product benefits. Other: Customer can reuse Bubble’s containers for their refill and save money by refilling their bottles. Zero Waste company: Reuses containers internally and customer option, uses packaging material donated to Bubbles, makes a new product from soap production scraps (“Bouquet Bar” – all types of soap scraps), and what’s left is recycled. Work 1061 Samoa Boulevard Arcata CA 95521 work Work Phone: (707) 822-7688work Website: CK Johnson Industries, Inc.
C&K Johnson Industries, Inc. is a full-service manufacturing firm engaged in structural steel fabrication for bridge construction and corrugated/spiral pipe and post-tensioning duct production. Johnson Industries is also one of the largest manufacturers of spiral steel multi-strand post-tensioning duct in North America. Their post-tensioning duct is found in scores of bridges and civil engineering structures throughout the U.S. and Canada. A range of standard and custom-designed products for highway and heavy civil applications. Steel Fabrication: Staff includes a qualified Professional Engineering team, a team of in-house professional steel detailers, one American Welding Society (AWS) Certified Welding Inspector , and a well-trained, skilled and experienced workforce. Drainage: C&K Johnson Industries is a full-line supplier of corrugated steel and polyethylene pipe for highway-related storm sewer systems, culverts and cross drains, edge and slope drainage, and retention/detention systems. Building Supplies: Their Northern California building materials division includes locations in Eureka, CA and Weaverville, CA. They offer a full line of lumber and concrete products. Oxy-acetylene and Plasma: Johnson Industries has the equipment and skills to burn (oxy-acetylene and plasma) roll, break, blast, shear, punch, form, and coat steel into virtually any precision-engineered product. Johnson Industries is a full-line supplier of corrugated steel and polyethylene pipe for highway-related storm sewer systems, culverts and cross drains, edge and slope drainage, and retention/detention systems. They offer standard steel pipe diameters of 6 inches through 144 inches in round and equivalent arch sizes; all manufactured to the latest AASHTO and ASTM specifications. The steel pipe is available in a variety of thicknesses and corrugations and can be furnished with a complete range of protective coatings such as zinc, asphalt, aluminum, aluminized or polymer. All duct is delivered to the jobsite or pre-casting yard in specified lengths and is coupled on site. Johnson Industries has a high production capacity. C&K has a blast booth and a contained painting operation, which allows them to provide a finished product. CAD/CAM integrated CNC burning and milling machinery. The capability to burn, roll, break, punch, and form steel into virtually any precision engineered product. Remanufacturing of printer cartridges, repairing of printers, copiers and faxes. CartiCharge Imaging LLC delivers free to Eureka, Arcata, Fortuna, Trinidad, McKinleyville, Blue Lake, Freshwater, Samoa, Manila, Ferndale — and we can ship to all areas of Humboldt County! CartiCharge Imaging LLC have a wide range of laser and inkjet cartridges available, including Hewlett Packard, Brother, Canon, Lexmark, Source Technologies, and more. We offer new, OEM (Original Equipment of the Manufacturer) brand-name cartridges and replacements for professional photographers and anyone who wishes to print using virgin new cartridges. Their services include free technical support and on-site trouble-shooting for machines that use our cartridges. They provide free estimates for repair and/or replacement costs. Their services include but are not limited to printer, copier, fax, plotter, scanner malfunction diagnostics, cleaning and maintenance work, extraction of foreign objects/matter from inside machines, removal and replacement of broken/problem parts, installation of rollers, blades, fusers, and other consumable components. CartriCharge Imaging remanufactures only OEM (Original Equipment of the Manufacturer) brand name cartridges (cores). They disassemble the cartridge of its working components, empty and vacuum out residual toner, replace worn and/or broken parts, assemble and fill with packaged, pre-measured bottled toner, then test print function and quality using the reassembled cartridge in our test printers. If there are any defects in the test prints, they evaluate whether the cartridge is able to be repaired to remedy the cause of the problem or if its reuse is unreliable and so retire it. They accept cash, checks, Mastercard, Visa, and purchase orders. Castle is a manufacturer of machines for local woodwork vendors. Its range of products includes pocket cutters, assembly tables, drilling and driver bits, wood plugs, glue pots, trimmers, filters, casters, cylinder rebuilding kits and screwdrivers. The company operates an online store that offers ordering services. It provides financing options through third-party lenders. Castle sells its products through a network of dealers throughout the United States. The company supports various programs related to the development of woodwork businesses. It works in association with Cabinet Solutions and Bainbridge Manufacturing. Castle offers online technical information related to equipment replacement and repair.